The use of cinnamon in making ayurvedic, Greek and Chinese medicines is being used for thousands of years. Even today, it is used in the treatment of many diseases. Mix elaichi powder in cinnamon powder. This is beneficial in stomach problem such as constipation or acidity. 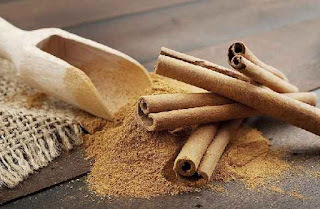 The consumption of cinnamon powder with honey reduces obesity. Mix one glass milk with cinnamon powder. This avoids heart diseases. Cinnamon tea improves blood circulation. This avoids pimple problem. The mixture of cinnamon powder with water controls diabetes. The mixture of ginger and cinnamon powder controls cholesterol. Take half ginger juice with ¼ teaspoon cinnamon powder. The daily consumption of it in morning is beneficial. Ginger contains gingerols and cinnamon contains anti-oxidants. This reduces cholesterol.